With online casino games holding such a special place in the hearts of New Zealanders, there is a plethora of online pokies available to play. There’s just so much variation and choice when it comes to modern slot games. There are some pokie games that really capture the imagination and don’t let go. Let’s take a look at some of Kiwi’s favourite classic pokies and see which ones make the Top 5. With a new movie reboot starring Alicia Vikander set to be one of the biggest releases of 2018, Tomb Raider: Secret of the Sword is a 5-reel, 30-payline video pokie with a maximum bet of 10 coins per line. This means players have a very high chance of a big payout. Plenty of Wilds, Scatters and bonus symbols offer lots of chances to win and the bonus round, called the Global Adventure round, is triggered when the passport symbol lands on all 5 reels. Collect all the hidden sword fragments to win the entire bonus game. Lara Croft’s face is the Wild symbol and it can substitute for all the symbols except for the Scatter, which is an ancient green gleaming relic that can unlock 10 Free Spins. Thunderstruck II is the sequel to Microgaming’s massive hit, Thunderstruck. This pokie game was such a success that the follow up had to be ten times better, with enhanced graphics, an even more immersive storyline and more ways to win. This slot game is a 5-reel, 243-payline game with a special achievement feature, so players can keep track of their winnings. This game has Wilds (the Thunderstruck II logo), as well as expanding Wilds you can land over all five reels. The Scatter symbol is Thor’s magical hammer which lets you enter the Great Hall of Spins to gain a bigger chance to trigger any of the four Norse God bonus rounds. Mermaids Millions is an epic “under the sea” adventure with a beautifully vibrant aesthetic. It’s a simple 5-reel, 15-payline video pokie with a jackpot that could net you up to 7500 coins. The Scatter symbol is a beautiful mermaid and if she appears on three or more reels, you’ll unlock a bonus round of Free Spins. The stormy sea-god, Neptune, is the wild symbol that will substitute for all other symbols, except for the treasure icon Scatter symbol. You can unlock the secret round with three or more bonus symbols: here you can choose between shells, treasure chests and mysterious barrels that will reveal secret cash prizes. This vampire-themed pokie game is a gothic thriller, which attracts lots of morbid Kiwi players with its dark and exciting storyline. This game takes inspiration from both Twilight and the Vampire Diaries, so the slot developers really captured the cultural zeitgeist with this wonderful fangs-meet-pokies game. The game logo is the Wild symbol, which can substitute for all symbols except the brass lion symbol, which is the Scatter. Three or more Scatters will open the Chamber of Spins. During the Chamber of Spins round, you’ll get the chance to access three further bonus rounds. 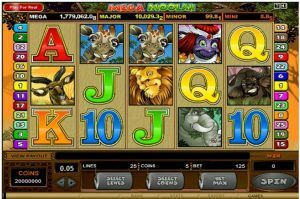 One of the most famous progressive pokies games of all times, Mega Moolah always tops the lists, so it’s no surprise that it is the top ranking online pokies game in New Zealand. This game doesn’t offer only one progressive jackpot — you get access to 4! It’s a 5-reel slot with 25 paylines and lots of bonus features to make landing a winning combo pretty easy. The roaring lion is the Wild symbol in Mega Moolah. This substitutes for all other symbols, except for the Scatter and it can double the wins as it functions as a multiplier. The interesting thing about Mega Moolah is that the progressive jackpot can be triggered at random, which lends a little bit of extra excitement to the game.